The handsome Berkeley eatery serves fresh pasta in the Northern Italian tradition — and stuffs it with a taste of Northern California. Hours: Mon.-Fri. 11:30 a.m.-2:30 p.m., 5:30 p.m.-10 p.m.; Sat.-Sun. 5:30 p.m.-10 p.m. When someone broaches the topic of ravioli, what image comes to mind? Plump little ricotta-filled pasta pockets sold in bulk at old-fashioned Italian-American delis — each one ruffle-edged and perfectly square? Or the soupy, sodium-laden canned-pasta stylings of Chef Boyardee? For most diners, ravioli are an afterthought rather than cause for celebration or genuine excitement. And at the Bay Area's better Italian eateries, you'll find at most a single ravioli dish on the menu at any given time. So when chef and first-time restaurateur Paul Oprescu decided to open Belli Osteria, a handsome Italian restaurant in downtown Berkeley specializing in fresh pasta, he saw a niche that hadn't been filled: He would make ravioli the centerpiece of the whole enterprise. He would serve dozens of versions — three or four on the menu at a time, rotating them in and out over the course of the seasons. Oprescu, a one-time Montessori teacher, cut his pasta-making teeth during a brief stint as a line cook at Berkeley's now-shuttered Eccolo. 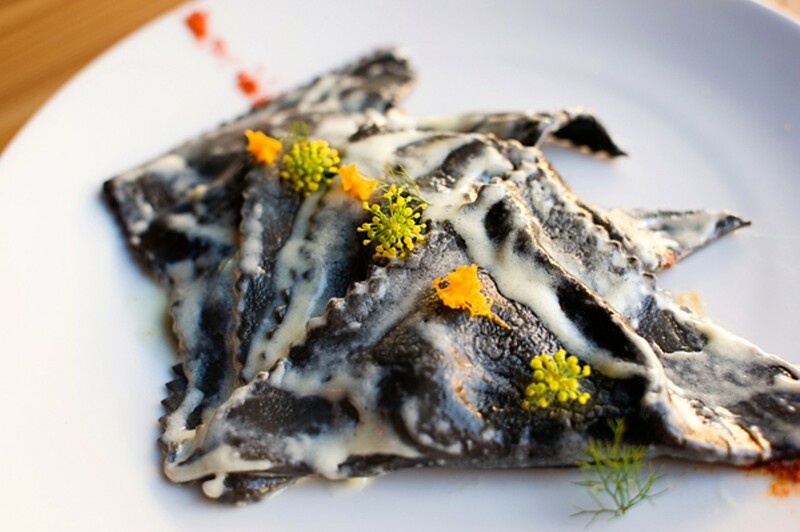 Like Eccolo, Belli Osteria draws inspiration from the cuisine of Northern Italy, but Oprescu saw an opportunity to break away from traditional Italian cuisine with his ravioli. He has said that he wants to do for ravioli what restaurants like Pizzaiolo have done for pizza — to marry Old World cooking methods with the creativity made possible by the bountiful produce and other high-quality ingredients available in Northern California. Why limit himself to ricotta and spinach? "We decided that ravioli would be the platform where we could engage our imagination," Oprescu told me. Order a plate of ravioli at Belli and the first thing you'll notice is that they're huge — maybe three or four times the standard size, so there are only four in a single order. Each raviolo is handmade, so they have a rustic quality (maybe an edge is curled or a corner isn't perfectly sealed) and are shaped, variously, like folded handkerchiefs or little UFOs — not a square among them over the course of my two visits. The pasta itself is notable for its toothsomeness — something closer to that al-dente bite that's usually missing from fresh pasta. Oprescu said he uses flour with much higher semolina content than is found in traditional Italian "00" flour. There's a tradeoff, though: The pasta lacks some of the lightness and the melt-in-your-mouth tenderness that are the calling cards of fresh pasta. That quibble aside, the three ravioli offerings I tried were uniformly delicious: One showcased the mellow, earthy combination of sweet potatoes, roasted garlic, and goat cheese. Another savorier version was filled with cabbage and tender braised pork, like some awesome and very distant cousin of Chinese jiaozi (dumplings) — Marco Polo would be proud. Best of all was the black squid-ink ravioli, filled with shrimp and spinach and served with a spicy, buttery tomato cream sauce. In each case, the fillings weren't so much unusual or innovative as they were simply well thought-out and delicious. Of course, Belli serves other things besides ravioli, and the meals I had there yielded a few highs and lows. The highs: a Roman-style tripe stew (meaty and tender, and kept light with a generous sprinkling of peppermint) and an entrée of grilled lamb served medium-rare with sliced kohlrabi and baby potatoes that had soaked in all of the lamb's fatty juices. The lows: a plate of salumi featuring Kentucky cured ham and house-made duck prosciutto (both tasty, but sliced so thickly that they were hard to chew), and a molten chocolate cake (no better or worse than what you can get at any number of places) that was topped with two hard, off-season strawberries that were almost entirely white. Given those minor snafus, it's only fair to point out that Belli isn't an inexpensive restaurant. Although nothing on the menu costs more than $20, the portions are small enough that a single dish won't be a filling enough dinner for most people. While the ravioli, for instance, are huge, you're eating mostly extra noodle — the filling-to-pasta ratio is quite low. If you order a salad, a pasta, an entrée, and a glass of wine, all for yourself, you'll get a tasty and wholly satisfying meal — but you're also likely to have spent somewhere north of $60. For that kind of cash, I'd rather eat at Oliveto, where the pasta dishes are more delicate and soar to greater heights. That said, Belli's recently launched lunch service is a great option for the budget-conscious. At lunchtime, you'll pay $2 or $3 less for the same plate of pasta, in exchange for somewhat less formal table service. Meanwhile, Oprescu said that aside from the ravioli, he hopes his restaurant will distinguish itself from the crowd by serving a lot of offal cuts, like tripe or sweetbreads or tongue — all of those so-called "nasty bits." Aside from Oliveto, I can't think of any other Italian restaurants in the East Bay with that particular focus. How would ravioli stuffed with, say, lamb's brains — one of New York Italian-cooking impresario Mario Batali's signature dishes — go over in Berkeley? I'd pay good money to find out.